HH the Aga Khan Visits Malaysia - 2012-03-30 | Ismaili.NET - Heritage F.I.E.L.D. His Highness the Aga Khan arrived in Malaysia today for the start of his visit to the Far East. In the country’s capital, Kuala Lumpur, he will officially inaugurate the exhibition titled Treasures of the Aga Khan Museum: Architecture in Islamic Arts at the Islamic Arts Museum Malaysia. The travelling exhibition of objects and art from the Aga Khan Museum collections has been shown in a number of major cities in in Spain, Portugal, France, the United Kingdom, Turkey, Germany and Russia. It will be on display at the Islamic Arts Museum Malaysia from 30 March to 29 June 2012, marking the first time that the collection will be displayed in Southeast Asia. NEW DELHI: Malaysia plans to use the archaeological conservation expertise of the Aga Khan Trust for Culture (AKTC) in efforts to preserve the country’s heritage sites, says Deputy Minister of Tourism, Arts and Culture Muhammad Bakhtiar Wan Chik. Muhammad Bakhtiar said he was highly impressed with the work carried out by the organisation in Hyderabad and Delhi. “We are looking at the model they are using to carry out the conservation work. Possibly, we will invite them over to help us revive our Unesco sites,” Bakhtiar told Bernama. KUALA LUMPUR: Visitors to the Aga Khan collection being showcased at the Islamic Arts Museum Malaysian (IAMM) were awestruck by the large range of items on display. Among the most notable is a miniature folio from 15th century Spain, glazed turquoise earthenware from late 14th century Central Asia, tiled arches from 15th century Egypt and decorated doors from 9th century Iran. Video of H.H. 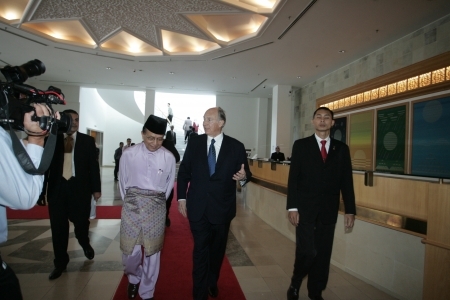 The Aga Khan leaving the Islamic Arts Museum in Malaysia.